The Bridgewater-Raynham Special Education Parents Advisory Council (BR-SEPAC) will be holding a presentation for the 2017-2018 school year on Thursday, March 8th at 6:30 pm titled, MassHealth Presentation. This will presented by Lauren Almedia of CCBC and Laura Conrad-Laberinto of MassHealth. Have you been told you should apply for Mass Health but aren’t sure if your family is eligible or what it can provide beyond your current insurance? 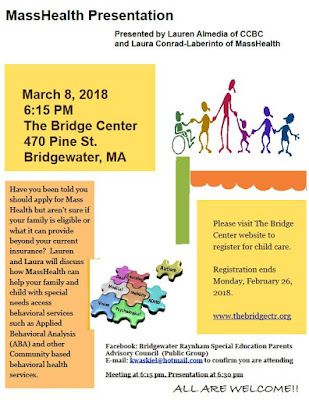 Lauren and Laura will discuss how MassHealth can help your family and child with special needs access behavioral services such as Applied Behavioral Analysis (ABA) and other Community based behavioral health services.